After trying, and failing, to find a trade partner for eighth-year linebacker Zach Brown, the Washington Redskins have decided to release him into the free agent pool. The move, which was first reported by Tom Pelissero on Twitter, will free up $5.75 million in cap space for the team. As Pelissero astutely pointed out in his report, Brown graded extremely well during the 2018 season with Washington. He ended the campaign with an 89.2 overall grade — a grade that was over 13 points higher than his previous career best — which ranked third among all qualifying off-ball linebackers. 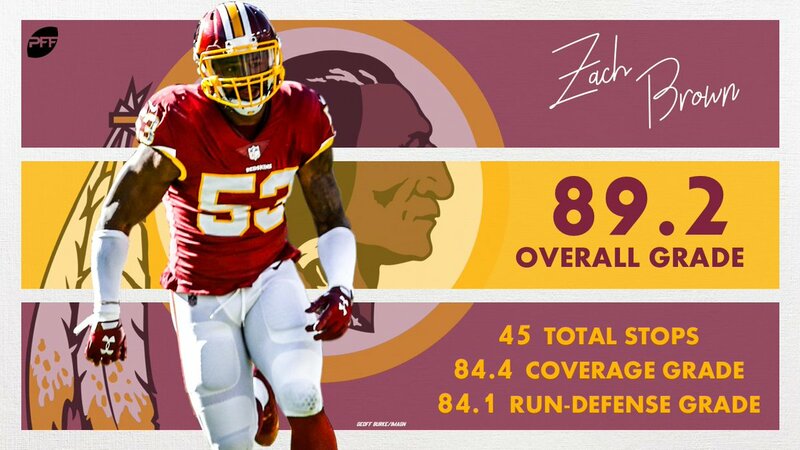 His overall grade was the result of high-level play in all facets of the game, and he ended the year as one of only three linebackers (Luke Kuechly and Bobby Wagner being the others) to register a run-defense grade, coverage grade and tackling grade above 80.0. Brown has always shown well as a run defender, so his performance against the ground game in 2018 didn’t really come as a great surprise. Over the last three seasons, Brown has racked up 95 defensive stops against the run, which are the third-most among linebackers in that span, while his three-year run-stop percentage of 9.2% and his three-year run-defense grade of 84.7 rank 11th and eighth, respectively, among the 66 linebackers with at least 500 run-defense snaps in that span. While his performance against the run was unsurprising, his improvement and performance in coverage were what vaulted him among the top players at the position. After recording a putrid coverage grade of 38.1 in 2017, Brown bounced back in a big way in 2018, ending the year with the seventh-best coverage grade among linebackers (84.7). All told, he allowed 35 catches from 45 targets for just 283 yards and was one of only six linebackers to play at least 350 coverage snaps and not allow a single touchdown in coverage. Coming off a career year, Brown will be an intriguing option to any linebacker-needy team in the NFL, and his improvement in coverage, a vital skill set in today’s NFL, gives him an added boost as he’s set to test the market.